UPDATE Oct 2018: RAMCHECK has released adapters for 288-pin DDR4 memory, specifically for the RAMCHECK LX model tester. However, DDR4 cannot be supported on the older RAMCHECK model PCSTATS reviewed in this article, as its design is too old (circa 2000). UPDATE Oct 2010: A 240-pin DDR3 adapter (p/n INN-8668-16) for the RAMCHECK and RAMCHECK LX is now available. More details about the adapter, including a movie showing it being used can be see here and here. The RAMCHECK DDR3 memory adapter runs about $1995 and works with both the RAMCHECK and RAMCHECK LX memory testers. Older RAMCHECK units may need a hardware upgrade to use the adapter, which Innoventions will do at no extra charge. Please contact the company directly for more details. Designed and built with the reseller, memory manufacturer and computer service center in mind, the Ramcheck memory tester from Houstin-based Innoventions is a one-of-a-kind portable memory testing platform for the professional. At a cost of just under $2,000 USD for the standard unit, the Ramcheck memory tester comes in fairly inexpensive in a market populated by large desktop testers that can range in price from as much as $8,000-$26,000USD. The basic unit comes in a padded protective case with a serial cable, power supply, desktop software and instructions. Depending upon individual requirements, expansion adaptors can be used to widen the capabilities of the Ramcheck from standard 168-pin SDRAM through to DDRAM, SODIMM, SIMM, and even individual TSOP memory modules. The versatility of the unit is quite unique, though at first glace it presents a more humble impression. 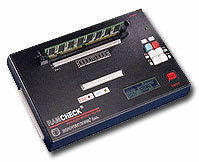 The Ramcheck owes much of its boxy look to the previous memory tester Innoventions offered, the Simcheck II. By maintaining a cohesive layout, the company assured that users of its's earlier generation memory tester could easily upgrade their unit to the more current Ramcheck simply by switching out a component PCB board. Additional firmware upgrades can be done automatically online once the unit is connected to a computer via the serial cable. Thus the upgrade path is an easy one for companies which have invested in the product, and this ultimately lowers the total cost of ownership. A Device Under Test (DUT) interface handles the following aspects of memory tests; "16 multiplex DRAM/Module address lines for up to 4G addresses of direct processor access. Main control lines: 4-RAS/-S lines, 8-CAS/DQM lines, 2-W/WE lines, 2-OE lines, 2CKE and 4 Clock lines. Complex wave generation and digital delay synthesis on all -RAS/-S, -CAS/DQM and -W lines. Advanced setup of Tred and Trah setup at 1-2ns resolution. Three programmable regulated voltage sources 1.25v-5.7v with automatic current limiters. EDO/FRM DRAM access time: direct measurement from 150ns down to 20ns at 1ns resolution, +/-3ns accuracy. SDRAM clock access time: direct measurement from 150MHz to 66MHz with 0.5ns resolution, +/-1ns accuracy." The unit we tested came to us with the DIMcheck 144 expansion adaptor in addition to the onboard 168-pin SDRAM socket. Once docked onto the main unit, the DIMcheck 144 adaptor makes it possible to test SODIMM memory modules. Innoventions have also just recently announced the release of a new 184-Pin DDR Adapter for testing Double Data Rate (DDR) SDRAM. The new adaptor (cost $1,495USD) will finally allow the existing Ramcheck platform to test PC2700/2100/1600 memory, including registered and unbuffered DIMMs. Given the popularity of DDR memory with consumers this feature is at least six months overdue, and very much welcome. The Ramcheck uses a 184MHz test engine to test 133MHz and higher memory using a page burst feature where all cells are tested simultaneously. This is a quicker type of testing, and can help identify errors caused by interference among the chips. If the facility conducting the tests has the capabilities to repair a error-stricken RAM module, the Ramcheck's ability to point out which chips, and even which solder joints may be causing the errors is invaluable. Powered by a 40MHz Texas Instruments 486 processor, the Ramcheck also uses an 184MHz Altera CPLD as a secondary SDRAM test engine. With 6MB of onboard memory the unit features an internet upgradeable 512KB flash ROM, serial port for PC communication, 128x32 pixel backlit LCD and proprietory test algorithms. The device measures 9.5"x6.5"x3", weighs 3.5lbs and comes with an external AC adaptor. Test algorithms used in the evaluation of memory include: Checker patterns, Walking 0/1, Voltage cycling and Voltage Bounce, March up/down, Self-Refresh and Auto loop with changing patterns. There are essentially two possible configurations for the Ramcheck to be operated under. The first is simply to plug the unit in and read off the data from the small backlit LCD display. This works well for situations where memory modules in are being tested for compliance to one or two points of reference data (speed, error bits, etc.). However, in environments where memory is being sorted according to more complex parameters, and test data for each module needs to be recorded, a more effective option is available. Using the Ramcheck's serial port, the unit can be connected to a standard desktop computer and the data logged in real time as the testing progresses using a companion software program.